Color camera. USB3 interface. Live image in brightfield and fluorescence. Native BIOQUANT drivers. BIOQUANT OSTEO collects data on images of tissue slides, welled plates, or anything else that can be captured with the camera or scanned into an image. For more information, see BIOQUANT OSTEO Imaging Options. BIOQUANT OSTEO can be configured with several hardware options to enable live imaging and/or scanning from within BIOQUANT. Microscope Upgrade Kits range from adding a digital camera to generate a live image in our Measurement window, to adding full slide scanning support. Scanning Upgrade Kits for Existing Microscopes. 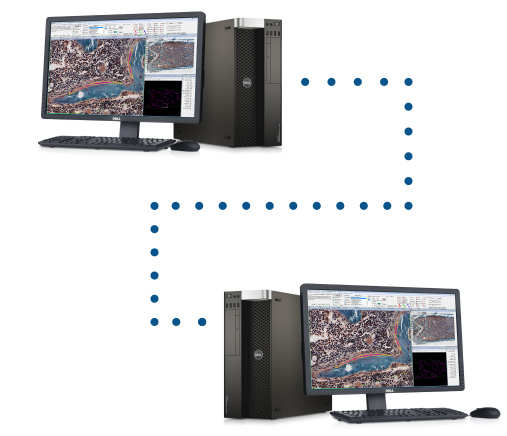 Four Kits are available for a range of imaging solutions and budgets. OSTEOIMAGER: a modular, inverted, scanning microscope. Scans up to 0.28 microns per pixel in transmitted light, polarized light, darkfield, and multi-channel fluorescence. Skeletal phenotyping is the quantification of structural and cellular data to describe the effects of experimental interventions on the skeletons of research animals. It involves the collection of both structural data describing the amount and organization of bone as well as cellular data describing the number and activity of different cell populations including osteoblast and osteoclasts. The analysis of human bone biopsies is an important tool in a variety of clinical research tasks including kidney transplantation and genetic defects in bone formation. Analysis of cortical bone cross-sections is often associated with the investigation of mechanical loading. Changes in cortical thickness as well as the number and distribution of osteons can help quantify these effects. Many kinds of cancer metastasize to the bone marrow. Once there, osteolytic tumors can cause the rapid destruction of bone. Analysis of tumor volume, bone volume, and the number of osteoclasts can help understand this process. Orthopaedic implants are more successful then the are organically integrated into the bone. Consequently, a great deal of research goes into engineering the surface of an implant to promote bone growth. Analysis of bone formation within a zone of re-growth around an implant, and the determination of the length of the bone to implant interface helps evaluate these devices. The neonatal formation of new bone is driven in part by the rapid growth of uncalcified cartilage. Examination of cell proliferation patterns in chondrocytes can help shed light on this mechanism. There are several unique automated cell counting tools in BIOQUANT to accelerate this work. The analysis of the epiphyseal bone in animal models of osteoarthritis helps explain changes in mechanical loading as the articular cartilage disintegrates. This analysis often shows a thickening of the subchondral bone plate as well as an increase in the number and thickness of trabeculae. Subchondral bone is composed of multiple biologically distinct structures. These include trabecular bone, a cortical plate, and a zone of calcified cartilage. This protocol details the analysis of those various compartments and the cells that inhabit them including hypertrophic chondrocytes. Many different staining techniques are used in the analysis of muscle tissue. The preferred staining method depends on the type of data to be collected. Nuclei located in the center of myofibers tend to be associated with myofiber regeneration and certain types of muscular dystrophy. The number of centrally located nuclei per myofiber is one of the data points collected by the myofiber analysis tools in BIOQUANT. Using immunofluorescent laminin staining, BIOQUANT can automatically measure the number, size, position, and circularity of myofibers in an entire cross-section. The primary benefit of automated muscle analysis is that labs can measure entire sections in the time it used to take to measure a handful of random fields of view. This helps compensate for inherent biological variability in tissues and helps improve the statistical power of the data. Immunofluorescent labeling makes it possible to perform muscle fibertyping on a single physical section. This significantly reduces the complexity and time required for the analysis. The addition of a specific label for either dystrophin or laminin further improves automation. Immunohistochemical staining with DAB chromogen is relatively straightforward and targeted toward specific fiber types. However, the use of a single color means that sequential sections are still required. BIOQUANT documentation is written in PDF with embedded video tutorials. As part of our Technical Services Plans, each lab receives one-to-one training via remote desktop screen sharing.